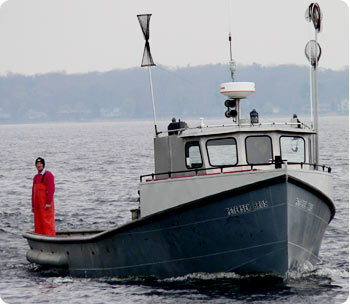 Bill Petersen’s grandpa went into commercial fishing in the late 1920s or early 1930s. Four of Bill’s uncles followed in their father’s footsteps. Bill and his two brothers—Chris and Allen—have kept the family tradition alive, with their operation based at Muskegon. Now Bill’s son Eric and his nephew Joel pilot their trap net boat out onto Lake Michigan, ready to lift the pots and return with their catch of whitefish. The Petersen brothers knew, even before high school, what they were going to do. They had learned a lot from being on the boats from the time they were young, and they knew they’d like to be out in the fresh air, running their own business, enjoying the variety of weather and tasks, rather than working for someone else inside at a shop. “There’s nobody telling you what you have to do or when you have to do it. You make your own decisions. You sign your own paycheck,” Bill says. They’ve seen lots of changes over the years—in their gear, in the laws governing their occupation, in the markets and in the fishery itself. At first they could fish perch, and then small mesh and big mesh gill nets. Then a court decree required them to change their gear, so they spent a summer in the Upper Peninsula, learning the unfamiliar ways and means of trap netting from the VanLandschoots in Munising. They’re fishing in deeper water now, adjusting to changes in the whitefish’s behavior, brought on, it seems, by zebra mussels. As for the weather, the Petersen brothers’ most exciting times on the lake include a 110 mile per hour wind ride when they were teenagers. As their father cut off their gill nets, the sea spun them around and pushed them back to port uninjured, to their families’ great relief. The business has its ups and downs, too. “Some years you take a beating, and some years you make out halfway decent. If you are still in business, I guess that’s a success,” Bill says. 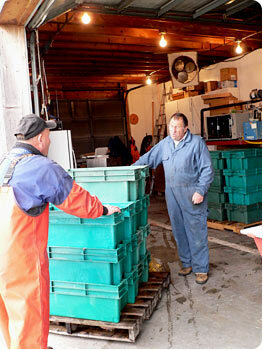 And they’re still in business, catching and selling their annual quota of 300,000 pounds of Great Lakes whitefish.